Privacy advocates are asking a judge to rule that NSA internet data collection is a violation of the Fourth Amendment without deciding what that means for the future of the program. On Friday, privacy advocates at the Electronic Frontier Foundation (EFF) are attempting a new strategy in their six-year-old lawsuit against the National Security Agency. Filed in 2008, Jewel v. NSA is a suit calling for the end of the surveillance of millions of AT&T customers' internet traffic and emails. Despite evidence provided by an AT&T whistle-blower, the US district court, under pressure from the federal government defendants, has delayed and avoided judgment, suggesting that the case raises issues too secret for the federal courts even to rule upon and too important for national security to shut down anyway. Now the EFF is asking the judge to simply rule that there is a current violation of the Fourth Amendment, which protects US citizens from illegal search and seizure, without deciding what that means for the future of the program. The specifics of the allegation are complicated (computers are hard! ), which, of course, is a boon for the powers that be in Washington. But the EFF's new dumbed-down strategy could be exactly what opponents of unlimited, unaccountable surveillance need for a breakthrough. According to AT&T technician Mark Klein, the telecommunications company has routed copies of internet activity and emails to an undisclosed room in San Francisco controlled by the NSA. The allegation has been strengthened by the testimony of three other former NSA whistleblowers, documents published by the Washington Post and the Guardian as part of the Snowden leaks (as well as a June 6, 2013 statement from James Clapper, the director of National Intelligence). The collection of data from AT&T users comes in a four-step process, according to the EFF. At the time an email is sent, one version goes to the desired recipient, while a copy is diverted by an AT&T splitter and sent to the NSA. Next, the email runs through a rough filter meant to eliminate any fully domestic communications. Third, the government employs a search algorithm to scour contents "for particular 'selectors'—email addresses, domain names, phone numbers, or other identifiers," according to the claim. Finally, the communications that contain the specific "selectors" are stored in a government database. The government has argued that this collection of personal data is justified by Section 702 of the 1978 Foreign Intelligence Surveillance Act, which allows the attorney general and the director of National Intelligence to target specific non-US citizens outside the country for surveillance. The argument hinges upon the fact that algorithms and filters have sorted the emails and activity before humans at the NSA look at the data during that fourth step. 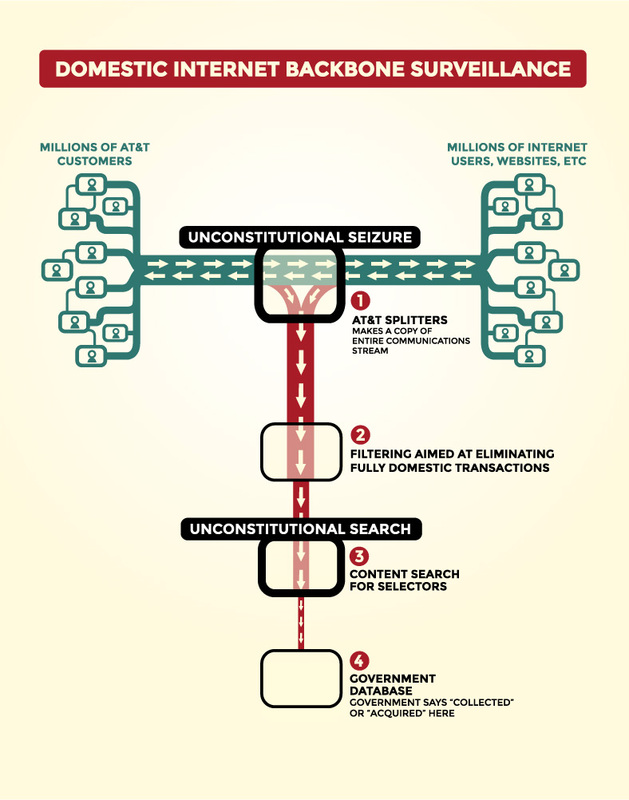 The EFF argues that the use of algorithms and filters is in and of itself a form of search and seizure, and therefore a violation of the Fourth Amendment. So why does this matter? First, what Senator John McCain—hardly an enemy of the national security state— argued about torture holds true for the use of surveillance as well: Its use compromises that which most distinguishes us from our enemies. The idea that the government has access to every email US citizens send is a terrifying, North Korea–level violation. At its core, the construction of the American government, as laid out by the Constitution, is supposed to discourage centralized power. The country was built as a retort to the absolute rule of English monarchy, and the Fourth Amendment was written to end the practice of general warrants, allowing for a complete search of a home in Colonial America without probable cause or a specific aim of the search. The harvesting of all emails without a specific warrant seems to clearly violate that foundational right. You might say that Google and Facebook already have all our information, so who cares? That's arguably true (and frightening), but so far, both companies have sold that information to advertisers in a more general way (a 25-year-old male likes Kendrick Lamar and cat videos). And more important, Google and Facebook do not control the laws of the nation, despite their efforts to influence them via lobbying. There seems to be a proliferation of the argument that only terrorists or other guilty people need to keep their information private—the "I have nothing to hide" case—but that simply doesn't hold water. The Founding Fathers constructed the Constitution to be an absolute protection of certain unalienable rights. The internet is still in its Wild West phase, but that does not give the government the right to our data without a warrant. As it stands now, the NSA can choose the "selectors" with the OK of only the attorney general or the director of National Intelligence. The tradition of an independent magistrate granting specific warrants is absent from the current model. So what will a judgment—or a continued lack of ruling—on Friday mean? That's the hardest part to understand. If the judge rules that what the NSA is doing is unconstitutional, it would be a groundbreaking check on the unwieldy use of surveillance since 9/11. But it might not actually stop that surveillance. Still, there is value in such a ruling even if it doesn't fix the problem right away. The outrage over the horrors of 2014 has been the lack of even a facade of justice—in Ferguson, in New York, and for the torturers in the Senate Report. It would be a moral victory if Judge Jeffrey White found the NSA in violation of the constitution. We need proof, however small, that those in power will be held to account by the same laws as all other Americans.